The Lane Keeping System helps you remain in your lane in three possible ways. Steering wheel vibration indicates you're nearing lane markers. Steering torque helps steer you back to the center of your lane. 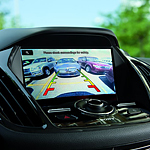 The driver alert system uses a forward-looking camera to monitor your driving patterns, alerting you with audio and visual warnings when you begin veering outside of your lane. Automatic high beams toggle between low and high as you travel down the open road and encounter oncoming vehicles. A forward-facing camera mounted behind the rear view mirror detects oncoming lights up to 2,000 feet in front of you, toggling down to low beams to prevent blinding other drivers.